Dennis Blackmore Agent Owner/REALTOR® with Creed Realty gives Virginia Beach and Hampton Roads buyers an enhanced new real estate IDX home search blog to help them find the perfect dream home or condo. Hampton Roads includes the cities of Chesapeake, Norfolk, Suffolk, Portsmouth, Hampton, Newport News, Williamsburg along with Virginia Beach. The Advanced IDX includes all real estate in these areas plus more. Using the most up to date Internet Data Exchange (IDX) technology enables home buyers an easy, yet thorough method to search all types of real estate in Virginia Beach and Hampton Roads. IDX is simply an approved Multiple Listing Service (MLS) using enhanced technology to make a more detailed and buyer friendly home and condo search experience. Now Virginia Beach and Hampton Roads real estate buyers can search for homes easily and have total control with advanced features. Buyers can login and manage their favorite listings and saved searches, update their contact information, add special notes, reminders, comments, and more on their custom IDX profile page. Saving home searches is easy and buyers will automatically receive daily emails with new and updated listings from the MLS IDX feed that match their criteria. If buyers prefer they can develop their own customized MLS IDX RSS feeds for any home or real estate search for use with Google, Yahoo, Outlook, or any other XML feed reader. This includes home searches for foreclosures, short sales, or both. Outstanding functionality includes exclusive sliders which make it fun and easy to increase or decrease the beds, baths, and other values included in their IDX search, exclusive full-screen photo viewer provides a fully immersive experience for browsing through photos for each IDX listing, larger than average thumbnail pictures for every listing direct from the IDX feed, zoom, pan, and drag around inside our IDX map interface and see listings appear as you search. 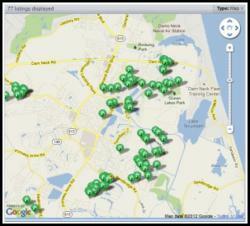 Instant listing results combined with familiar Google Maps make our IDX map interface easy for buyers. A Bird's Eye View map from Bing gives an aerial view of each listing. Custom polygons are available on buyer maps to limit IDX search results to specific islands, coastlines, or any other outlined area. Lastly, each IDX listing includes a mortgage calculator with prefilled price, down payment, and customizable interest rate, School markers and school district outlines help buyers see where the area schools are, as well as local school ratings, right on the IDX map. In summary, the Virginia Beach and Hampton Roads Real Estate Advanced Search Blog is the latest technology to give the potential buyer an unequaled experience in finding their dream home or condo.